This entry was posted on Saturday, March 23rd, 2013 at 1:24 pm and is filed under CameraFraud.com, News, Redflex. You can follow any responses to this entry through the RSS 2.0 feed. You can leave a response, or trackback from your own site. 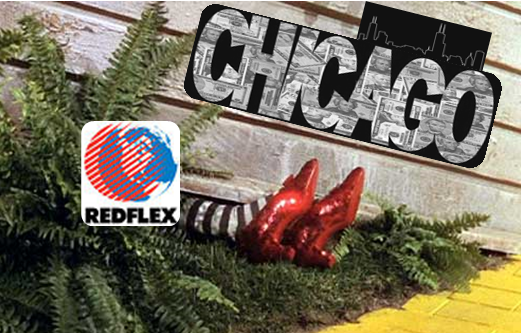 One Response to Phoenix Runs for Cover from Scandal – Where does the next Redflex Shoe Drop? Just move to Mesa and within 2 days I got a red light ticket. The crosswalk is not the marker it is the lazy curbs that extend past that white line that are. It has been 7 years since I got a ticket! A U-turn ticket. One of those do not do a U turn on the 3rd Wednesday of the month if the moon was full. Irregardless if there is not a soul on the road coming. Before that 7 years. Now I slam on my breaks at the site of yellow and am so busy watching my speedometer I do not have time to be a defensive driver. I was looking for a license plate cover but I am not sure what cameras are being used to get the right ones. There are IR and so forth. If you know post it and become an affiliate for them. You took the time to publish this. Get paid. 350 dollar ticket or 214 with traffic school for what would have been a legal run in Ca. The person in the turn lane going in left in the intersection going my direction had yet to even get thru his turn when I had passed him. Can be seen in the pic. They say a cop reviews em.